Hand-Held Public Broadcasting, err, Podcasting! Some folks may complain that CBC is increasingly irrelevant in our modern 24-hour news and Internet world. Everyone seems to blog constantly, CNN reports more news than any person would ever want to know, and Twitter is delivering information directly into our cellphones. How can Canada’s public broadcaster possibly compete with that? Well, they’re giving it their best shot, and the results are quite pleasing. The CBC was an early adopter of podcasting, creating the internet-only CBC Radio 3 (also available on satellite radio), and released it to great success in the iTunes store. Now they’re moving into new avenues for mobile devices. Now the CBC has jumped onto the iPhone bandwagon, creating a website, specifically for mobile devices (and especially the iPhone). Readers in Canada’s capital will be happy to hear this includes the Ottawa regional news website. On Aug. 1, CBC debuted its radio app, allowing iPod Touch and iPhone owners to stream Radio 1, 2, and 3, and access on-demand audio programs. The app has risen to #14 in the iTunes Canada store, clearly demonstrating a demand for this kind of product, at least among Apple enthusiasts. 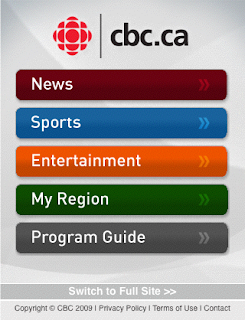 The app is so easy to use, even a person with no iPhone experience could figure out how to stream the local Ottawa station. And best of all, it’s totally free. If the CBC continues to embrace new media and mobile technologies, there may still be a place for it in the hearts, minds, and cellphones of Canadians after all.